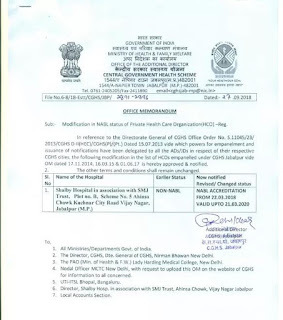 CGHS Jabalpur: Modification in NABL status of Private Health Care Organization(HCO) -Reg. Sub:- Modification in NABL status of Private Health Care Organization(HCO) -Reg. 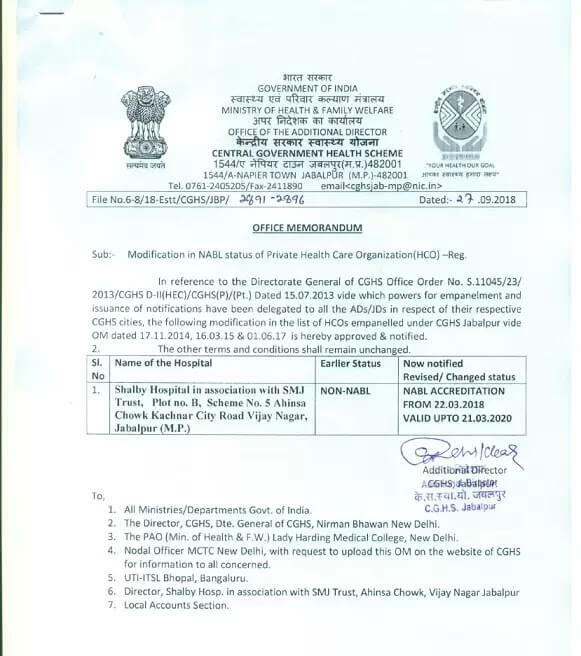 In reference to the Directorate General of CGHS Office Order No. 5.11045/23/2013/CGHS D-II(HEC)/CGHS(P)/(Pt.) Dated 15.07.2013 vide which powers for empanelment and issuance of notifications have been delegated to all the ADs/JDs in respect of their respective CGHS cities, the following modification in the list of HCOs empanelled under CGHS Jabalpur vide OM dated 17.11.2014, 16.03.15 & 01.06.17 is hereby approved & notified. 2. The other terms and conditions shall remain unchanged.